I think the true indicator that you've achieved a certain artistic maturity in your work is that your style is immediately recognizable. Before I began using polymer as my primary medium, I felt that I really didn't have a style, a signature creative presence. Looking back at my earlier textile work I realize that I did have one-- I just didn't hadn’t created a body of work large enough to be able to see it easily. When you begin to dedicate substantial time to your artistic work, whatever it is, your style begins to emerge, no matter where your creative experimentation takes you. When I first started in polymer, I tried lots of other artists' techniques until I finally began to devise some of my own. But when I look at all the pieces I've created, I see something that is very distinctly “me”. Another polymer artist – and good friend of mine-- who has this distinctive style is Claire Maunsell, of Stillpointworks. Over the few years I've known her, she has produced many, many beads of all shapes and styles and yet-- there is a distinctive “claire-ness” about all of them, an evident curiosity for color and texture and finish that is intriguing and different and special. I bought beads from her all willy-nilly, not knowing what I would do with them but also knowing that they were pretty much one-of-a-kind and would never be seen again made in exactly the same way. So they sat in a box and waited for inspiration to strike. I would occasionally take them out and marvel over the colors and the tiny subtleties of them-- only if you are a beadmaker can you appreciate the intricacy of something so small and how many decisions are made in every step of the process of making them-- blending the clay, forming it, curing, painting, re-painting, applying coating after coating and the final finishing. And then it waits, full of energy and the artist's personality, ready to be made into something that has never before been seen in all the Universe. So it's a bit daunting to attempt to do a set of pieces using all the various small marvels that you have collected, in an effort to pay homage to an extraordinary artistic vision while creating something that reflects the artist's unique style while simultaneously expressing your own. Now if I had started this post in an organized fashion, I would have the before-and-after photos, so you could see the beads before I used them. But I just dove in as I always do! So..... I started by stringing a bracelet of many strands, using some beads that Claire had sent as a 'thank-you' for purchasing, one-offs that were all in the same basic colorway. Whereas my base antiquing color is usually burnt umber, Claire's is black so I used various silver chains and beads to tie her colors together, along with some repurposed pink beads from my sister's stash. When Claire sent me the large pod she said “I'm sure you'll find a good use for this” and I did, as a ballast to keep the bracelet from slipping around the wrist to the toggle side. I made the toggle to coordinate, using only Premo clay and embedding the wire findings into them. I've worn the bracelet several times and have no doubt that the clay is sturdy enough to do its job. As for the earrings, I decided to string the sweet little pod duo in a very minimal way--unlike some of the other interesting uses I've seen by others using Claire's signature bead-- so as to honor the perfection of her coloring and texture technique. I simply used annealed steel twisty wires with a bit of patina and silver earwires. Then the big challenge-- what to do with the cunningly-created interlocking beads? I wanted to do something dramatic but understated, modern and yet somewhat organic. I've become very fond of dangles and tassles lately so I used lengths of an old silver chain and combined it with some minute silver beads and gemstone chips to weight the dangles. Next I dug into my stash for some African glass rounds in purple and gray and added some Czech glass rondelles with a Picasso finish, all complementary to Claire's palette, to top off the bead stacks. Then the whole composition sat for a few months while life and other projects had to be taken care of. 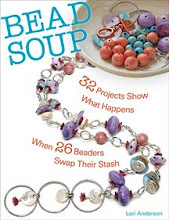 When I finally got back to my “Claire Project” as I had begun calling it, I had a brainstorm and went to my Mary Hettsmansperger book “Wrap, Stitch, Fold & Rivet” for a look at her project “Bead Shelf Necklace”. 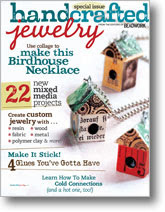 Although her tutorial uses metal sheet, my take on it used--of course-- polymer clay, which I have been using more and more lately to build connectors and toggles that customize nicely to my palette and are easy to fabricate. 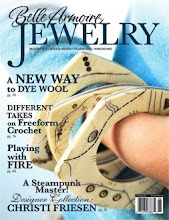 I textured and folded and cured and antiqued and colored and then began to attach my bead stacks. It took a lot of tweaking and fussing but I believe that I achieved what I was going for-- a modern and interesting way to stage Claire's beads that was still true to her organic style and colors. After crafting sterling silver squiggles to connect to the chain and the bead shelf, I declared the piece well and truly finished. Thank you, thank you, Claire for providing the most challenging and exciting collaboration design I've ever done! I hope you like what I've designed with your beads. Isn't the palette just perfect for the snowy holiday season? I can tell you that I will cherish these pieces forever. Living on a farm as I do, something is always banging or squeaking or thumping in my house after my head hits the pillow at night. The field mice are rampant this year—maybe a result of the long, hot summer?—and my cat would rather sleep off her supper than hunt. Little things chew in the walls—chipmunks frolic nocturnally on the front porch—sometimes a bear comes to raid the birdfeeder. So I lay there—is it the wind? or something more sinister? I’m pretty sure my sewing room is haunted. My sis came to visit last summer and claims she encountered a ghostly visitor who, though benign, was a shock to see upon waking in the middle of the night. But this is an old house—1830s—and there is much history here, of families who were born and lived and died here, had arguments and happinesses and conflicts and relationships and I’m just an interloper. I think the house tolerates me—cabinet doors don’t bang closed or things disappear, never to be found. But I love this old house and have always tried to take care of her and honor her construction and the ancient materials that form her bones. As the Celts hold the tradition of appeasing the Little Folk with a saucer of milk, so my Old House gets the best Ben Moore Paint and quality sheetrock from Home Depot. But sometimes I wonder. For several years now I’ve made a piece especially for Halloween, which is actually the Celtic New Year, Samhain (saw-win) as a kind of jumpstart to the autumn season of indoor projects and freedom from garden and outdoor chores. Last year I made a small protector, a talisman against the Things That Go Bump in the Night. I call him the Little Man and he sits on the windowsill above my workbench where he can scare away bad things (or at least banish horrible artistic decisions). When my ongoing owl obsession kicked in a few months ago, prompted by a visit to see some of the real creatures up close and personal at the Vermont Raptor Center I started a pair of owl earrings. As a base I used a Victorian metal stamping of an owl with wings outspread, added some metal leaf to white polymer clay and then finished off with acrylic paint and gilders wax. Keeping with the orange and black color scheme, I used some gorgeous agate drops and copper spacers, finished with a dangle of tektite. So they feel mystical and otherworldly at the same time, tektite being the by-product of a meteorite impact. While my sister was entertaining nighttime spirits in my sewing room last summer, by day she and I were playing with resin for the first time. She had brought along some mask molds that she made during a workshop by the amazing performance artist Sha Sha Higby and I made a couple up in polymer, since their faces were so compelling. I dug these out this week, added some Whimsy Wire connectors and strung them together with a shibuichi metal piece, some bone beads and a polymer pendant that I made a while ago. Sometimes things just have to sit around on my bench until they have the right purpose. For this year’s Halloween-themed piece, I began my process with a wonderful strand of vintage mother of pearl buttons I unearthed at a local antiques mall. They were very tribal in feel and I knew they would anchor the entire piece. I wanted to diversify the traditional orange-and-black color scheme so I crafted a pendant made with a mold of a found object metal piece I purchased on Etsy. I purposely mixed the base ivory color with a smidge of brown and black for a gray that would mimic the patina on the original piece. I added some dzi beads in orange and black designs, some andalusite rounds and a few lustrous vintage faux amber lucite beads. It will be very wearable for any season and is a little Goth (at least for me) in feel. I call it “Tribal Victorian”. Please excuse the dark post. I’m feeling very affected by the destruction that the hurricane caused on our coast. Some close friends have still not been heard from. I hold good thoughts of them in my heart and mind and urge you to as well. Teaching has to be the scariest and, at the same time, most exhilarating thing you can do as a human. You just have to fling yourself out there, be as authentic as possible and pray that your students are not only getting it but enjoying it. Bold is the way to go, no other way. What could be more terrifying than to look up at a ring of faces to see a look of total incomprehension on them all. But to look up and see everyone nodding and smiling-- ah, bliss! Soaring! My three days at ArtBliss 2012 in Sterling, Virginia were a non-stop whirlwind-- meeting people, taking in all the creativity of the assembled students and teachers, connecting with friends both old and new, putting every ounce of energy into making sure my students were inspired, motivated and successful. Cindy Wimmer and Jeanette Blix made sure that nobody was bored or hungry or uninspired-- there was so much to do that I didn't get to enjoy simply because I needed to recharge every night so that I could make sure my students go their money's worth. 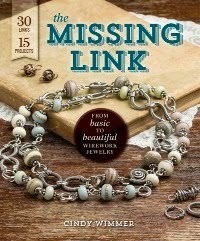 They organized bead and charm swaps, coordinated author signings, provided great food and encouraged camaraderie. Heartfelt thanks to all my fabulous students for conquering your fears about trying new things! Everyone seemed to trust themselves to delve deep into their creative wells and produced amazing work while supporting each other to expand and learn. What a nurturing environment! As usual, I didn't get all the photos I wanted to but thanks to the camera skills of several students, including Carol Myers and Kathleen Klik, as well as those of Cindy and my husband Douglas, I think I managed to gather enough images to give you a hint of the level of mastery and imagination that were present in my classroom. I am a very lucky teacher! I’m already thinking of ideas for classes for next year! 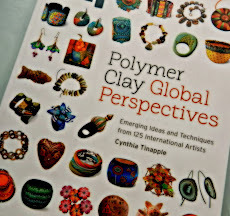 I’m going to continue with the idea of applying surface coloration to polymer since it seems that this resonates with people who have never used clay before but have experience in other jewelry-making and art disciplines or have worked with paints, paper and multi media. If you want to be notified of class topics for next year, convo me at www.storiestheytell.etsy.com. Hope you enjoyed the slideshow! I’ve been wanting to change my blog header for a while but had been unwilling to put the time into learning the vagaries of digital photo editing with the confusing array of formats, pixels and photoshopping options. But as I approach my 100th post I know it’s time I updated my look to acknowledge the evolution of my artistic style. Friends Cindy Wimmer and Claire Maunsell came to my rescue. Cindy turned me on to PicMonkey, a very user-friendly and fun program (don’t let yourself get too carried away with features) that has significantly more ability than my very low-level, free Photoshop program. Claire was having issues with Blogger, as was I, and discovered Windows Live Writer—which saved my sanity and my hair (as in the tearing out of) and has made blogging a pleasure once again. Also, Live Writer has a very easy-to-use photo resizer so I can manipulate the images easily. So now I’ve been playing around on PicMonkey and stored up several other headers so I have them on hand when my next urge to update arrives. So your patience with my housekeeping shall be rewarded with some eye candy. Here are several new pairs of earrings I’ve made for the ongoing 52 Pairs of Earrings Flickr group that I belong to. Now that I’ve taken the plunge and updated my blog template, I can also make my photos larger and my surface treatments show up to much better advantage. When I design a piece, I try to do it in an unhurried way, so that I can consider everything-- design, placement, elements, story-- without the pressure to finish for a deadline. Well, that's the ideal anyway. Sometimes the ideas just jump into my head and I work furiously on something, without any specific purpose in mind. Experimental ideas, especially. Usually I go to my sketchbook, to get my thoughts down before they dissolve like morning mist. But sometimes (usually) my housework, dishes, chores or whatever take a backseat to the siren song of my Muse. 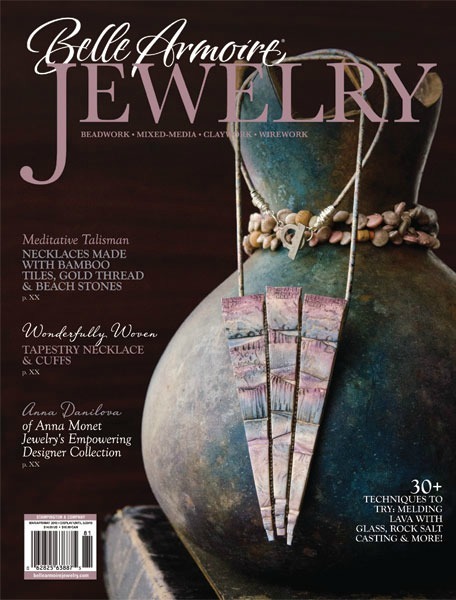 As most of you know, a lot of my large pieces were a result of my participation in the Art Bead Scene's monthly Challenges, with fine art works as the inspiration for a strung piece using art beads. Some month's selections call very strongly to me, as did the choice for March 2009 by Henri Matisse. This painting as a poster hung on the door of my bathroom after I saw the original at a Matisse show in San Francisco. Oh that orangey-red color! Pure passion and intensity! When I was a child, I wore greens, browns and rust. Who would have thought that these days the color red in all its many forms would be found in almost every room in my home? For my first take on this, three years ago, I made up a polymer clay mokume gane blend (a technique from Japanese metalworking where layers of different metals are revealed by drilling and grinding) of orangey-red, dark green, yellow and violet and applied slices to 18mm polymer bead cores. Then I made several lentil beads in different sizes and did the same. These were strung with black and red seedbeads and black coconut shell slices. Overall, it had the modern feel I was seeking to complement the abstract design of the lentil and round beads. I couldn't bear to sell the piece-- I just loved those red goldfish too much! But my style started changing too and became more complex and layered and I decided to re-do it. On a practical note: don't use coconut shell slices-- they have sharp edges and are uncomfortable to wear around your neck! I started with the focal, as it didn't seem large enough or too weak to support the other elements. I added an elaborate black and white textured frame but it was just too much. [The great thing about polymer is that you can continue to add new pieces to the original as long as you haven't coated it with anything that can't take the 275 degree curing temperatures.] I ripped off a lot of that and began to layer on a textured backing and finally had my focal design! Since I used acrylic for the color I could employ my favorite polishing medium—shoepolish-- for a subtle shine. Then the fun began-- I really love stringing!-- and I added irregular-shaped natural coral pieces, some Oaxacan clay bird beads, Dalmatian jasper chips, black bean beads, green vintage African glass and metal beads, some small yellow spacers and my mokume gane rounds. The clasp was hand-hammered annealed steel wire, which I also used for the twisty bail ends to attach the focal. So now my necklace is more complex and interesting, the feel is more tribal and yet still abstractly modern and my homage to Matisse's genius feels like my style, finally. Paired with the bead-stacked mokume ball earrings, I feel the second time around for this necklace is a true victory lap! As I sit here this morning looking out over my shimmering summer pasture, listening to chirping birds and cackling hens, it's hard to imagine the violent weather of last summer, known here as Tropical Storm Irene. Although we thankfully missed the destruction that many Vermonters endured, our lower pasture became a raging torrent of rain-swollen water. The stream bank that was formerly three feet above the surface of the water is now almost level with it. Luckily, this summer has been hot but very benevolent in terms of weather conditions and even allowed us to paint the rear wall of our house—summer painting projects are not always a sure thing in Vermont. The old adage about our seasons-- “nine months of snow and three months of bad sledding” isn't all that far off the mark! So we respect the weather here and it's usually the first topic of conversation when meeting others. As farmers, we know that every activity is dependent on the behavior of the natural world. So we respect Nature and learn to read the subtle signs and indications that She provides us every day. Since last summer I've had a pile of tree roots drying on my front porch from a downed tree that was completely uprooted by Irene. It's caused me to think on how everything in Nature is connected by design. The leafy portion of a tree branches out to gather sunlight and air from its environment, while below the surface, the roots expand into the soil to capture nutrients and water. But think about the human body—our blood system mimics the same design as it courses throughout our bodies, very like the trees in my front yard. From heart to large veins and arteries, down to the smallest capillaries, these tiny streams branch out to the furthest parts of our fingertips, so similar to the branches and roots of a tree. So this was my inspiration as I began to wrap polymer strands around my fingers into wreaths and rounds of clay, textured and antiqued and colored with pencils and oils. Picture jasper rondelles and pyrite were added to add reflective surfaces to complement the matte quality of the branchy beads. I finished off with beads from a prayer mala-- it seemed fitting, as this piece began as an experiment and ended as a meditation on our natural world. The idea of exploring an unknown island where you might discover anyone or anything has captured the imagination of storytellers for centuries and, given the recent huge popularity of “Lost” on TV, it shows no signs of slowing down. What will we find-- lost treasure, hostile inhabitants, a wormhole into another galaxy? The possibilities are endless. 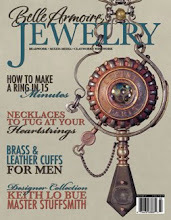 Summer in the jewelry design community usually brings lots of pieces that reflect our passion for sun and surf. I'm a rocks-and-crashing-waves kind of beach person, not a sun-worshipper-- freckles and red hair don't pair well with Sol's sunny assault when July comes around. But I love beachcombing and tide pools and weird seaweed and beach glass and old metal and stones and shells. So when I set about finding elements to use with a little experimental focal that Douglas made, my thoughts turned to mermaids and shipwrecks and things that have lain under the sea for eons. I adore the color aquamarine so slices of Impression Jasper from Lima Beads (link) set the color palette this time. I had a random collection of polymer beads that didn't make it into other pieces and had some thematic affinity so I began to fill out the strand with those and picked up the color of carnelian along the way from Douglas' focal. Following instructions in a MissFickleMedia tutorial, I heavily patinated some bronze African rings and added those to some patinated droplet fringes. Rough carnelian rounds from my favorite Etsy seller in Vermont, One Piece at a Time paired nicely with discs of Roman glass from Happy Mango Beads. The bracelet to match (sometimes I just have to) is in process but the earrings came together quickly. Picture yourself wearing the necklace and some tiered, white, ethereal gauze creation, walking barefoot along the beach at sunset and looking forward to an intimate dinner with...........who would you most want to be marooned on a desert island with? Button, button, who's got the ......? Cindy Wimmer's Button Blog Hop a few weeks ago really got my button-related creative juices started. My partner in this button love-fest, Celeste Thurston, had sent me a package filled with more buttons than I could use in just one creation. Since I work a lot with the color red, I decided to finish up a piece that I started over two years ago. 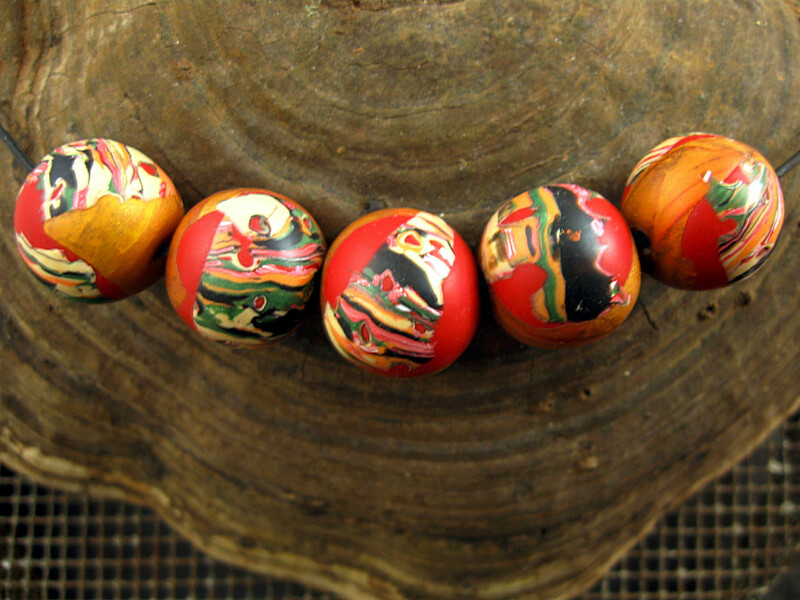 Starting with a polymer clay mokume gane blend of red, green, white, black, pink and cream I covered a quantity of beads with slices from the mokume stack, placing them over a base of red and gold. I had a lot of the mokume blend left over so I amused myself with building a long cylinder bead (4”), intending at some point to wrap it in wire. The resulting beads were reminiscent of gypsy bandannas and I sold several sets on Etsy. Then the leftovers sat in a bag. About a year ago I found the Gypsy beads again and began building a necklace base, using some red flower-shaped Czech glass beads with Picasso finish-- my favorite!--older twisty gold polymer spacers, early faux coral polymer beads and some experiments with Maggie Maggio's watercolor technique for polymer which I adapted to my own eclectic style. The long cylinder bead proved difficult to position in a design, since it needed to hang vertically in the piece. 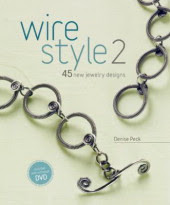 My idea for the wire wrap evolved into a beaded wire twist, which not only added color to the cylinder but also morphed its shape into something more interesting. Again, the necklace sat, waiting for .....something.... to motivate me to finish it. Then inspiration struck. For the Button Challenge I had made a complex polymer base for the Bakelite buckle from Celeste which had Mayan overtones (for me). I decided to made another base to support a red Bakelite bead from my stash and stage two more buttons from Celeste on top-- a Bakelite cream fluted and a red Czech one. But this time I decided to go with a round design to play up the shape of the buttons. I layered and sliced and built and then antiqued the focal in various colors before glueing on the buttons. While all this was coming together, Douglas was viewing a program called “Ancient Aliens” about the recent discovery of a massive complex of buildings beneath the waters of Lake Titicaca in Bolivia, near an amazing pre-Inca ancient temple site called Tiahuanaco. One of the images made him call me into the living room to look: it was the image of a god with a halo of shapes very similar to my focal! I never turn my back on synchronicity so I looped two large jumprings from a chain purchased at Michael's through some convenient holes in the focal and my long process was completed. I named it “Stone in the Center” to honor the temple site, Tiahuanaca, and the deep and mysterious lake in the Andes Mountains. When modern meets ancient, the two can make some real design drama together.